Property Owners: List your Franche-Comté property on the premier site specialising in French holiday lets. More Info. 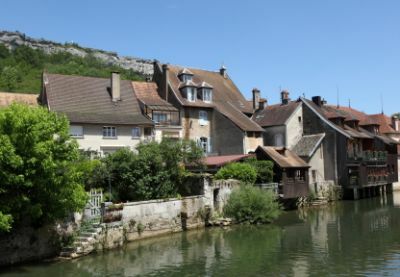 View villas and gites in Franche-Comté. If you’re looking for something a little different, try a gite holiday. Franche-Comté gites give you the best of all possible worlds, as you are free to come and go as you desire while experiencing something of what life is like for the local population. An equally popular choice among holidaymakers is a Franche-Comté villa, which provides a very comfortable base from which to explore the local territory. A good place to start is in Besançon, the capital city of the region. This ancient city, ranked as one of the best-preserved historic cities in the whole country, nestles in a loop of the River Doubs. Out of its many attractions, one of the most popular is the Citadel, which stands on a gigantic piece of sheer rock, blocking the entrance to the loop. Apart from being a fine example of military architecture from the seventeenth century, it hosts an insectarium, a zoo and a variety of museums. Château Chalon, in the Jura, is a pretty village that overlooks the famous vineyards that are responsible for the excellent wine of the area. You can walk in the vineyards, visit the wine cellars and look around the Church Saint-Pierre, an historical monument with a roof made of lava stone. The twelfth-century church also houses a mixture of Gothic and Roman art. Within a few kilometres of Château Chalon, you can find all manner of interesting places to pass the time. At Plasne, you can see how Comté cheese is made, while Mantry offers a cellar tour and wine tasting. Fay-en-Montagne is the place for horse riding through vineyards and around lakes, and if you’ve got five days to spare, why not enrol on a course to make stained glass windows? It takes place in Poligny, and although it costs a few hundred euros, what an opportunity. The food in Franche-Comté follows its traditional roots, in that it’s rustic and warming. The modern day visitor benefits from the type of fare that was needed for the shepherds and other inhabitants to keep body and soul together. Saucisse de Morteau and Saucisse de Montbéliard are two traditionally smoked sausages that should pass the lips of every visitor. They are often cooked, with potatoes, in milk, before being drained and served. The region is also home to some outstanding cheeses, Comté being the most famous. Made in discs of some twenty centimetres in diameter, the cheese is usually sold in slices. It has a brown, dusty rind and a pale yellow interior. The flavour is mild and slightly sweet. Other cheeses to get the taste buds tingling are Morbier, Mont d’Or, Bleu de Haut-Jura and Cancoillotte. Finally, a mention for the region’s honey. The honey producers are quite rightly proud of the fact that they win medals and other awards for their top-quality products every year. The three types to look out for are wattle, dandelion and fir tree, although the clover, lime tree and sunflower varieties shouldn’t be overlooked.